A propane gas grill is a wonderful cooking device to keep in your yard to quickly grill up your favorite foods. 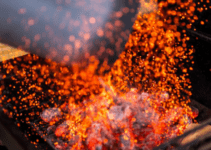 Most gas grills today can easily be lit by turning on the propane gas, adjusting the heat knobs to the light position, and then pushing an automatic ignition button to spark the flames. It only takes about 10 to 15 minutes to preheat this type of grill. You then are ready to start grilling up some hamburgs, hot dogs, steaks, or whatever other food you may enjoy cooking over the flames. Yes, yes, this is not your traditional grill with grates. You are not going to get the sear marks that everyone loves on your steaks. However, this flat top gas grill griddle is amazingly versatile with its ability to cook just about any food. There are obvious limitations to traditional grills such as smaller foods slipping through the grates. Try grilling eggs or some diced onions over the direct grates. You are going have a burnt mess underneath those grates. This Blackstone griddle allows you to cook endless meals outdoors without the worry of flame flare ups or lost food through the grates. This Blackstone gas grill griddle offers 15,000 BTUs for each of the four burners. There are 60,000 BTUs in total over all the stainless steel burners. The heat can be set between low and high for a variety of heat options. It comes with a battery powered push button ignition to make start ups hassle free. If you purchase this grill griddle, you will receive 720 square inches of grilling space. You will have no problem preparing typical full-sized meals on this grill for the family or a small to medium party. 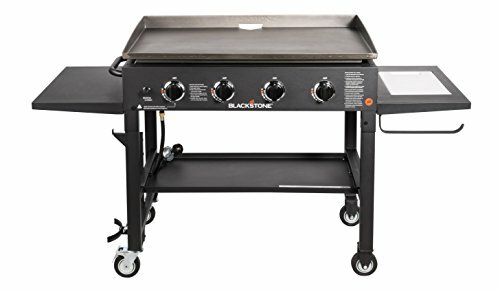 This Blackstone grill griddle comes equipped with a large bottom shelf, a side shelf, and an additional side shelf with a cutting board, trash bag hooks, and a paper towel holder attached just below the shelf. 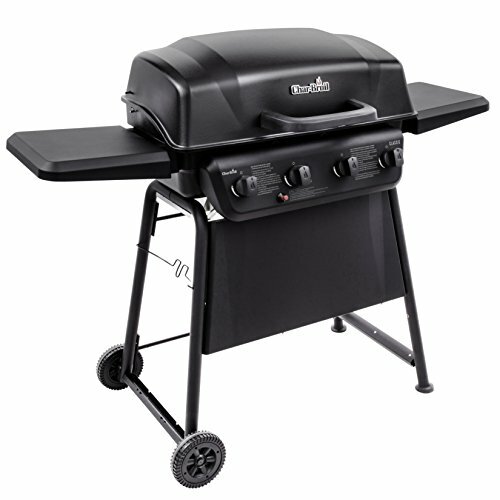 The Char-Broil 4-burner propane gas grill provides 475 square inches (25.6 wide x 18.5 deep in inches) of cooking space in its main grilling area. The secondary side burner provides 175 square inches of cooking space. This is a nice size grill for being priced under $300. It will have no trouble accommodating a meal for a family of five. 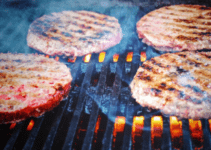 The manufacturer states that the primary grilling surface can handle up to 20 hamburgers to give you an idea of its size. The cabinet main 4-burner unit is 36,000-BTUs, while the side burner is 10,000-BTUs. The grill comes equipped with porcelain-coated cast iron grates that are rust-resistant. There is both the main grates and a top grates for an additional cooking surface that is farther away from the flames. This grill is stainless steel at the lid, handle, control panel fascia, and cabinet . The two metal shelves on either side of the grill provide a nice area for setting trays, plates, tools, or a beer/beverage while operating the grill. The front double doors lead to the propane tank storage area (propane tank not included), the grease pan, and extra storage for things like grill tools or heat-resistant gloves. The control panel features a button for electronic ignition to allow for rapid ignition of the flames to preheat the grill. The lid of the grill contains a convenient temperature gauge to help eliminate the guess work out of what temperature you wish to grill at. If you are tight on space, this Fuego Element grill might be your solution. The cabinet is large enough to hold a standard 20 pound propane tank in its cylindrical shape. While that is about all it will hold, it makes a great addition to a small deck or patio. The grill hood is 6.5 inches tall and contains a thermometer to easily check your temperature.The manufacturer indicates that the grill will heat up to 500°F in only 5 minutes with a maximum temperature of 700°F. While this grill is indeed a space saver compared to other bulkier grills, it can grill up to 16 quarter-pound burgers at a time. The cooking surface covers 346 square inches. The durable porcelain-enameled cast iron grate is 21 inches. Other features of this grill include anti-tilt locking wheels, which allow the grill to be moved around with ease. The grill also contains a residue tray for excess grease. The manufacturer claims that this grill is five times more fuel efficient than premium grills with its ability to offer 20 hours per tank at its maximum. The Dyna-Glo DGB390SNP-D offers a total of 507 square inches of cooking space. There are 390 square inches of primary cooking surface and the remainder is secondary cooking space. 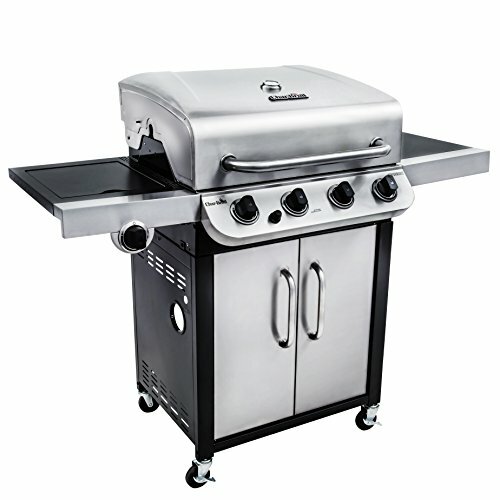 This grill comes equipped with three stainless burners that allow up to 36,000 BTUs in total or 12,000 BTUs per burner. The grill can be quickly started with an electro-pulse ignition. Additionally, you are able to monitor the grill’s internal temperature through the thermometer gauge located on the outside hood of the grill. The cast iron grates are coated in a high gloss porcelain enamel. The combination of cast iron and porcelain helps produce an excellent heat source to cook the food properly and is simple to clean. A great feature of this grill is that the side tables collapse to provide extra room when needed. Each side table can handle 25 lbs. and are equipped with tool hooks and a towel bar. If you are experience around the grill, you probably realize how handy both the side tables and hooks/bar can be. We would suspect that most people associate Cusininart with quality indoor kitchen appliance or cookware. However, here is an outdoor grill made with the same high-quality that you would expect from other more popular Cuisinart products. The first thing you probably noticed about this grill is its super sleek design. 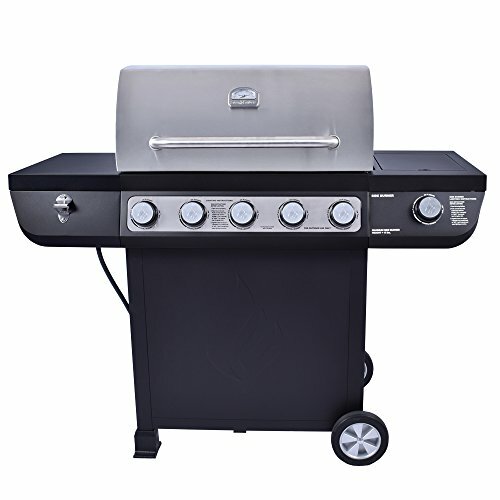 We especially like that large stainless steel knobs and handle, which give this grill some character that often other grills lack in this price range. Keep in mind that the cover, fascia, knobs, and burners are constructed with stainless steel. They are be able to withstand the elements without rusting. The front of the grill also features a classy thermometer on the hood to gauge the internal grill temperature. You will have ample room to grill all your favorite foods for the family with its 610 total square inches of cooking space. The main cooking area is 443 square inches, while the upper warming rack contains 167 square inches of space. The grill is heated by four 11,000 BTU burners for a total of 44,000 BTUs when all burners are utilized. The grates are made from a durable cast iron. The two side tables provide extra room to place a plate, tray, tools, or whatever else you may need while grilling. A super cool feature is the built-in bottle opener on the left side table. If you enjoy a cold beverage while doing some grilling, you know how important it is to have a bottle opener handy at times. 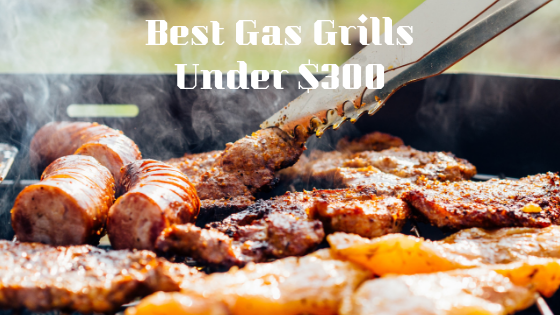 Overall, we believe this is one the best gas grills under $300 in terms of value on our list. In other words, you get a lot for what you pay. The Char-Broil Classic provides 405 square inches of cooking space. You will have no trouble cooking a dozen burgers and a package of hot dogs on this grill. 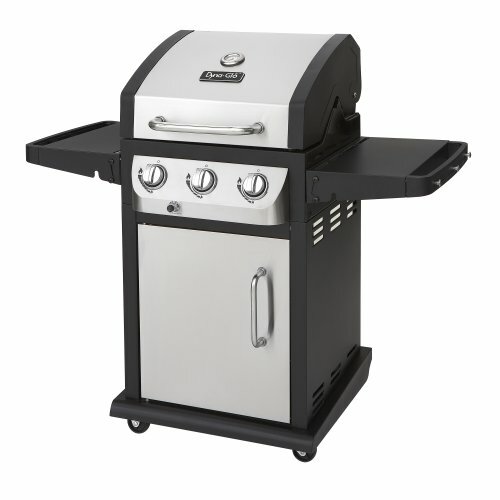 This grill features 4-burners that put out 32,000 BTUs. It is equipped with a Piezo ignition system, which will ignite the grill with a simple push of a button. 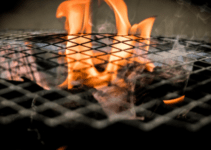 The grates, lid, and firebox are porcelain coated, which helps this grill hold up through various weather conditions and will prevent food from sticking. 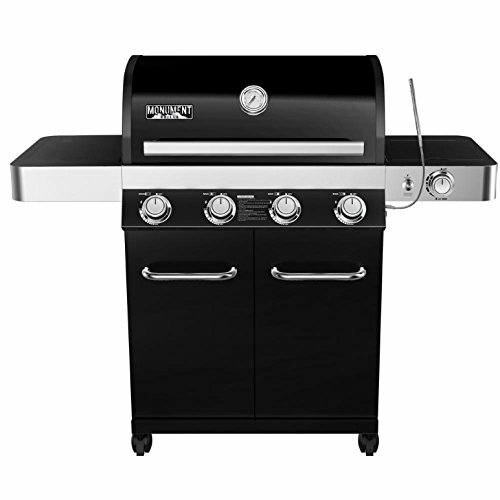 The overall dimensions of this grill are 54.3 inches wide x 24.1 inches deep x 43.5 inches high. The cooking surface measure 29 inches wide x 14 inches deep. 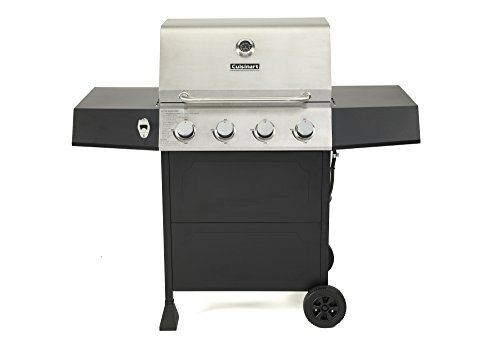 Other features of this grill included two 12 x 13.5 side shelves, two 6-inch wheels to adjust the grill location, and a 190 square inch swing-away warming rack inside the grill. The four knobs pictured on the front of the grill naturally control the four burners. The heavy-duty steel constructed Char-Griller 3001 is a solid and affordable choice for all your grilling needs. This grill offers 630 square inches of total cooking space. There are 438 square inches in the primary grilling area and 192 square inches on the warming rack. This is plenty of room for most household grilling. This grill houses three stainless steel burners that produces a total of 40.800 BTUs. The handy side burner offers 12,000 BTUs. The grill easily starts via an electric ignition button located next to the knobs on the console. The heat produced by each burner can be adjusted from low up to high for variable heat settings. This grill is currently priced well below $300, so if you are a budget shopping this might be one that you consider. The Even Embers grill contains 5 burners that offer 9,600 BTUs per burner. The burners are ceramic-coated, stainless steel, and backed by an amazing 10 year warranty. The grill also features a side burner that produces 12,000 BTUs that is great for sauces. The grates are porcelain-coated cast iron that will evenly and thoroughly cook your food. The lid is made from a high-quality fully welded stainless steel, which will stand up against the elements. This Monument Grills grill features LED lights on the knobs. This is an excellent feature if you routinely grill with limited lighting. The knobs are battery powered for wireless convenience. The grill also comes with an LED grilling light (USB – battery-powered). It comes equipped with 4 stainless steel burners that produce 72,000 BTUs. The manufacturer claims the burners will last at least 8 years. A side burner is also included, which is nice to have for things like sauces or for boiling corn. The grill has an electric ignition button for rapid start ups. The grates are porcelain coated cast iron to allow for even cooking and simple cleaning. Overall, we believe that this is one of the best gas grills under $300 in terms of looks on our list. We love the sleek black look with the steel accents. Of course, the LED lights also add a bit of style when they are turned on. Weber is one of the premier brands of grill you can buy. They are known for their high-quality and ability to last for years and years. 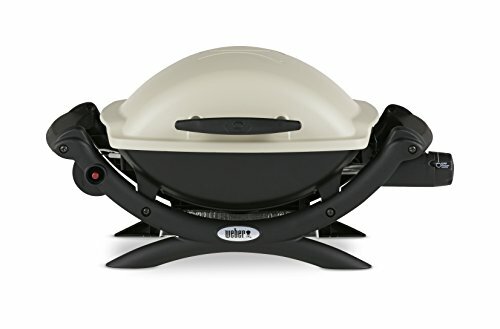 While you likely are not going to find a full-sized Weber gas grill for under $300, you can get a portable version for well under $300. The Weber Q1000 features a rust-resistant cast aluminum lid and body. 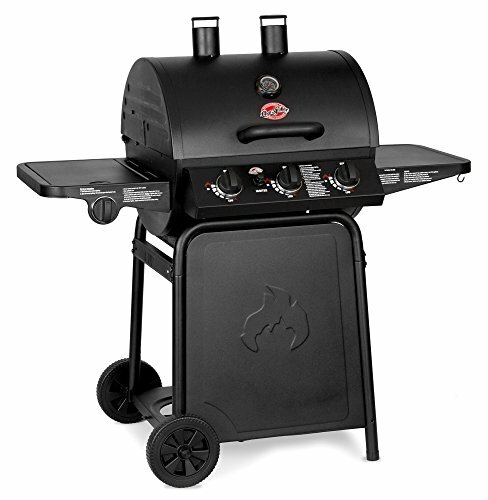 This grill is equipped with a push button igniter that quickly ignites the single 8,500 BTU stainless steel burner. The control burner value allows for numerous settings for your different grilling needs. 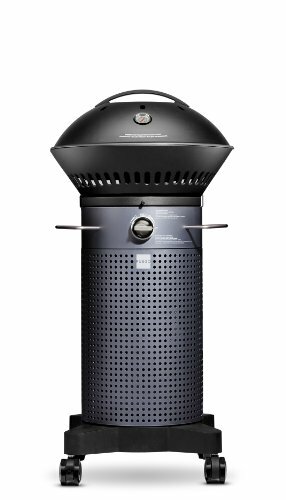 The dimensions of this Weber are 14.5H x 27W x 16.5D. However, the grill provides an amazing 189 square inches of grilling space for cooking. While you can certainly use this grill at home, it is also portable to take to places like the park, a picnic, tailgating, or various other outdoor events. This grill runs on disposable LP cylinders, but you are able to hook up a 20-pound tank when using an LP adapter hose (sold separately).